Can writing a list change your life? When I look at my own list of concerns, I see more clearly how the tectonic shifts in American public life affect my personal life, directly and daily, as I decide how much of the Times to read, whether I have a whole hour for Democracy Now!, how many petitions to sign or phone calls to make to my senators, when to write an op-ed piece, and when to let it all go, look around, be local, be humbly, simply present, and lean into the sun so I can bloom where I’m planted. Making a list of current concerns can also help us notice where our energies tend to flow as we live and move among people we love—how others’ losses, illnesses, and fluctuations of fortune affect us. We may be led once again to reflect on the importance of strengthening personal boundaries, for instance, or on the difference between generous sympathy and anxious hovering. In the list above, for example, I included “a friend’s divorce,” recognizing how deeply her pain and her husband’s tugged at my heart, and at the same time how important it was that I confine my concerns for the most part to prayer and availability. They needed space and time to work out their differences—not the “help” I might too readily be inclined to offer. So I refrained from calling to ask how it was going, which was a challenge for me. But naming it on my list of concerns gave it a place on my “mattering map” and reminded me I could own the concern without having to quell it by acting in ways that suited my needs rather than theirs. Even “my spouse’s discouragements,” which I witness at much closer range than those of my friends, are not, really, my own. As I include them on my list of concerns, I am again aware of my own need for ongoing discernment about when to “help” and when to let him walk, pray, wrestle, and reflect until he’s ready to talk. Some of our concerns we can address on our own; some we need others’ help with; some only God can manage. Naming them, specifying them, seeing them before us on the page, can help us distinguish which is which. The following excerpt is from MAKE A LIST: How a Simple Practice Can Change Our Lives and Open our Hearts (Eerdmans Publishing Co.), by Marilyn McEntyre. 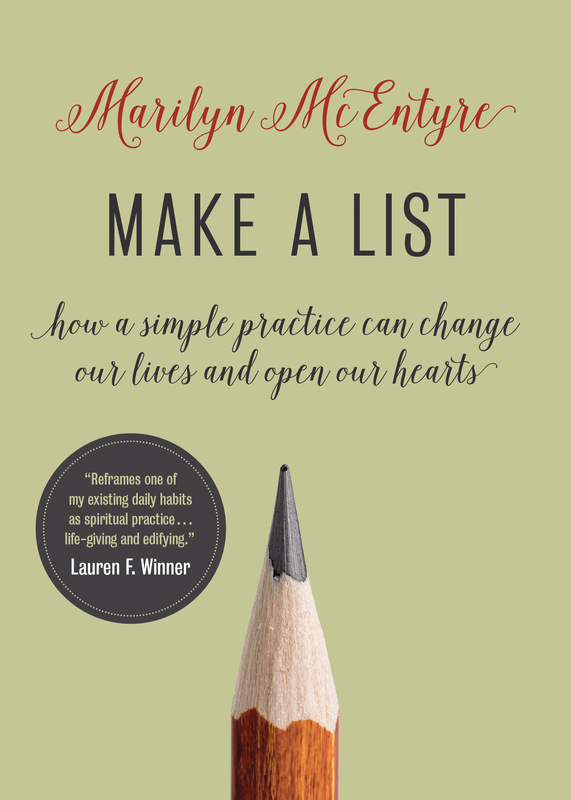 Marilyn McEntyre is the author of the new book, MAKE A LIST: How a Simple Practice Can Change Our Lives and Open our Hearts, What’s in a Phrase? Pausing Where Scripture Gives You Pause (winner of a Christianity Today 2015 Book Award in Spirituality), Word by Word: A Daily Spiritual Practice, and Caring for Words in a Culture of Lies. Her writing has appeared in The Christian Century, Weavings, Sojourners, Prism, Conversations, Academic Medicine, Medical Humanities, Literature and Medicine, and a variety of other academic and trade publications. Please visit www.MarilynMcEntyre.com for additional information.